Darius II (ダライアスⅡ) is a Shoot-em-up game, published by Taito Corp., which was released in Japan in 1996 for the Sega Saturn. Darius is one of those legendary, old school shooting games with features so distinct, that it made them entirely unique and unparalleled in the 80s arcades. Even more importantly, they retained and improved upon these features, evolving them from features to motifs, and thus created legacies. Take for example Gradius. Every Gradius title featured key elements: Vic Viper, the powerup system, infinite vertical looping, SHOOT THE CORE, endlessly looping gameplay at increased difficulties, and so on. Most if not all of these features appear in every game in the Gradius series, making any game in the series fully distinguishable from any other, seemingly generic shooter. 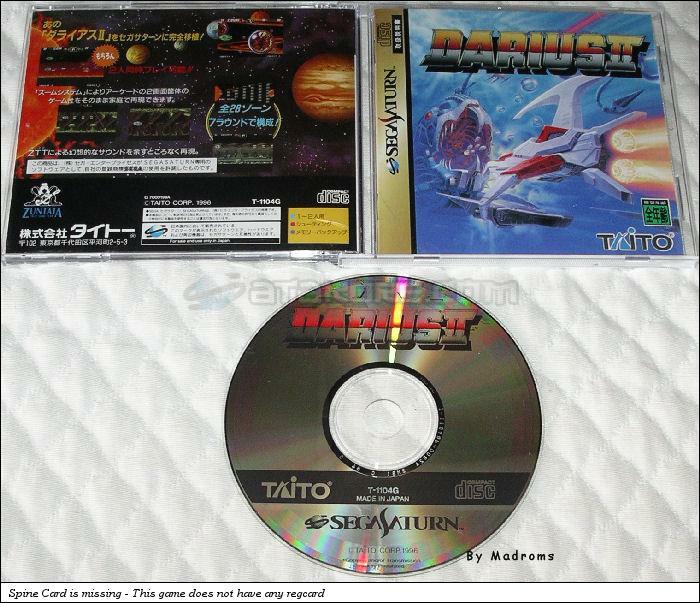 Darius (also known as Sagaia on some consoles) is another legendary title like this, where you control the trademark Silver Hawk ship, piloted by Proco and Tiat (as P1 and P2 respectively - their name spell out "TAITO CORP" backwards). So what are the key motifs of a Darius game? There are numerous that I can name, and I'll try my best to name all I can. Let's start with the most obvious: the game runs in an ultra-widescreen mode. The original arcade cabinet of Darius and Darius II used 3 normal monitors, placed next to each other, to display the full playfield (Darius II had a dual monitor version as well). Way back in 1987, Darius already rivaled the width and detail of todays high definition sets. Of course this is what suffers the most on a home console port, as you only have one screen to fit the game into. The Saturn version of Darius II takes this obstacle superbly well. The full 3-screen area is shown, and you can zoom in and out at will, during the game. This is very impressive, albeit not that useful: if you view the full screen, everything is too tiny to make out (as Darius II only runs in low resolution - cutscenes and the title screen is hires, tho), often you won't see enemy bullets. If you zoom in, everything is superbly detailed - but you can't see most of the incoming bullets! The best you can do is to zoom in halfway, and leave it like that. Another Darius trademark is the weapon upgrade system. Originally, you had 3 upgradeable weapons (in brackets are the corresponding powerup colors): a forward blast (red), a vertical angled bomb (green), and the ARM which is the name of your shield (blue). (Further powerups include a grey point bonus and golden "smart bomb", hidden on various locations in the levels) If you gather enough powerups in a single life, your weapon systems will be upgraded to a new level. What makes this special is that these upgrades are permanent! And as such, not that easy to reach. Of course, they are rather effective upgrades as well. Darius II, unfortunetaly, does not retain the permanent upgrades. Once you die, you are reset to the lowest levels. This is incredibly irritating. On the other hand, there are two exclusive features in Darius II: a special bomb which nukes any enemy on the screen (even bosses!) once detonated, and a green, vertical laser. Powerups can be unlocked only if you shoot down every enemy from a specific chain, unlike other Darius games where only the last - colored - enemy needs to be shot. But perhaps the most distinctive trademark of Darius is the visal style and its presentation, something present in every game of the series. Nearly all bosses - and some regular enemies as well - are based on various sea creatures. From crabs to ammonias to sperm whales to hammerhead sharks, even octopi are featured amongs the bosses, who all introduce themselves with the ominous "WARNING! A Huge battleship, -boss name- is approaching fast" phrase. All of these creatures are mechanical, or rather, biomechanical in design, with multiple destroyable sections (which limit or change their movesets). The biomechanical design is appliable to the whole series though, especially some of the backgrounds, but especially to the wierder boss designs (one of them is a human foetus!). The levels are all quite detailed, again the bosses in particular. Darius II also features midbosses, who are in fact returning bosses from the very first Darius. Important to mention are the branching levels as well. Present ever since the first game, but showing your complete routes first in Darius II. After every completed level, you are given the choice between two alternate routes. For example, your first stage is "Level A". Once beaten, you can choose between continuing on "Level B" or "Level C", with the text "Zone A is over. We are now rushing to Zone B (or C if you chose that). Be on your guard.". You are hopping from planet to planet as you progress in the game. Furthermore, every route awards you a different ending (based on the final level you have beaten). Because of this branching level design, you need to replay the game multiple times if you truly wish to see everything it offers. Darius II on the Saturn isn't quite the best example of the series. It features many never-again-seen deviations from the Darius motif, and its not the most fun title in the series either. The aformentioned zooming problem makes the game hard to see, and contributes to the absurd difficulty levels. The music isn't too special either, in fact Darius II may just have the worst music in the series. Other then the unique realtime zooming (and the cheesy lyrics of the first stage), the game has no real worthwile features, and is best avoided unless you want some retro action - and you already have the Gradius Deluxe Pack. It's a pity, if they would've included the original Darius as well, this game would be so much more worth it. Do you really want a Tuna Sashimi?